In the Official Gazette no. 22/2017 has been published Order no. 872/5932/2284/2903/2016 regarding the classification of the activities into software creation which provides the condition under which IT employees may benefit from the income tax exemption. Further to the publication and entering into force of this Order, the Order no 217/1721/1348/825 from 2015 has been repealed. Companies that are reorganized during the year are also exempt from obtaining any revenues from software creation activities in the reorganization year. Companies that intend to apply the income tax exemption should carry out software activities which will lead to the creation of an IT product or a part of a product to be sold. This newly introduced provision is rather unclear at this stage, but it could generate difficulties in applying the IT income tax exemption for employees hired by companies which deliver only software services and which do not create a software product. It is enough that these documents contain the mention that they are “according to the original”. In this case, their notarization is no longer necessary. Content of the job description. This Order will be applicable for the revenues related to February 2017. In order to benefit from the income tax exemption for the revenues relating to January 2017, the previous conditions provided by Order 217/1721/1348/825/2015 need to be met. 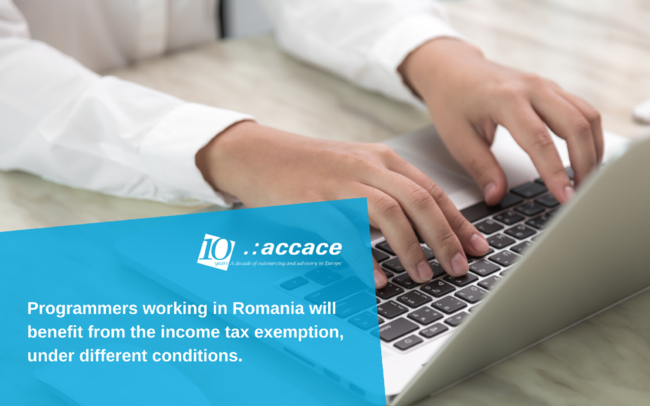 Do you need tax advisory in Romania? Let’s talk about how we can work together! How expensive is it to be an inactive taxpayer in Romania?